There’s no way around it—year four maths means multiplication, division, and other skills that just take repetition. Keep the practise interesting and your child engaged with these year four maths worksheets that cover all the essential maths skills in a variety of contexts that will never get dull. colour-by-number, maths riddles, colorful fractions, and symmetry drawing activities will ensure your child loves practising maths! Times tables, multi-step word problems, area calculations—there’s a lot happening in the year four maths curriculum! Our worksheets, developed by teachers and professionally designed, are here to make sure your child stays up to speed on the whirlwind of maths concepts they’ll encounter this year. 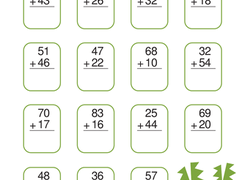 With hundreds of multiplication worksheets to choose from, your child will have plenty of opportunities to practise and master this important skill as they learn and apply the distributive, associative, and commutative properties of multiplication, solve real-world word problems, and get to know their multiplication facts inside and out. Multiple digits, multi-step word problems, and decimals add an extra challenge to addition and subtraction, and our wide selection of creatively designed worksheets will ensure your child’s skills are up to the task. 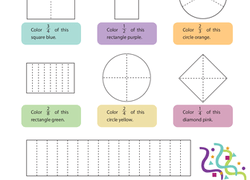 Geometry worksheets keep your child engaged and on track in areas of fractions, shape attributes, angles, and perimeter and area calculations. Or you can find plenty of practise collecting and displaying data, calculating elapsed time, rounding numbers and estimation, and converting metric measurements. Whether you’re looking for a timed assessment or a fun maths riddle, our year four maths worksheets have you covered.